Past the train tracks at the end of Ortiz de Ocampo there is a group of five soccer fields called the Canchas de Ocampo. And though the soccer pitch there is made out of some mix of astro-turf and sandpaper, I can faithfully report that the quality of the soccer played does not suffer. 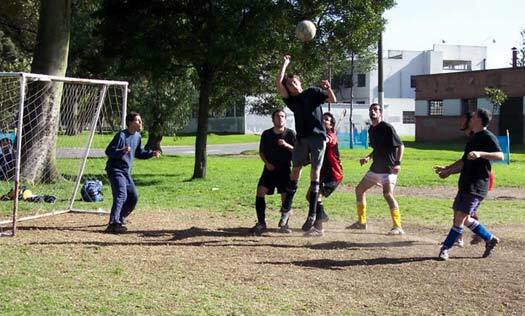 On any given night, you can find Argentine men (and sometimes women) hustling up and down the fields in games of 5-on-5 on the small fields, or full 11 vs. 11 scrimmages on one of the two larger fields. Most groups show up weekly with a reservation, but I will bet that if you showed up with shorts and a smile, someone will invite you to join their game. In our own weekly Monday night soccer game, anywhere from 10 to 16 ‘regulars’ will show up to play during our 9-11pm timeslot. Our crew is a medley of Argentines, Americans, Frenchmen, Spaniards, and Germans, where everyone takes pity on us Americans as we (apologetically) bring down the level of play. Our two hours of play usually runs us about $8-$12 pesos each, depending on how many people show up. And some weeks, when there is enough interest, we make a reservation to eat at the Canchas after our game. For about $30 pesos per person, the staff at the fields will fire up their huge grill and produce an all-you-can-eat parilla feast that rivals many restaurants in the city. The parilla meal includes salad and bread and costs about $20 pesos, and some assorted drinks and dessert account for the other $10. So if you are a sports nut like me, and itching for some competitive sports, head down Ortiz de Ocampo any night of the week until you hear the familiar sounds of people playing soccer underneath the lights. The author is actually no longer in Bs As. Thanks for asking though.